Recently, a friend forwarded to me this blog post about “ordinary time.” If you are familiar with the church calendar this phrase means something to you. If not, keep reading for a fuller explanation. This essay was a timely read for me. Like the daughter in this piece, my children and husband serve as my truth tellers when I trot out the “just be” responses in our household. For me, productivity equals a good day. I’m grateful for writers like Debi who express so eloquently the messiness and mystery of living in the ordinary. Um, yeah kid. Just like me. My children know me well; I am notoriously bad at just being. Just being makes me restless and grumpy. I wallow in guilt, convinced that I’m wasting precious time and accomplishing nothing of value. I much prefer trajectory. Direction. Busyness. I much prefer a point. As I’ve written previously in this column, I didn’t grow up following the liturgical calendar, so the rhythm of the church seasons is still a novelty for me — a wise, wonderful novelty I’m eager to learn from. But the season we’re in right now? The season of Ordinary Time? I’m finding it a bit difficult. A bit counter-cultural. A bit nerve-wracking. If I had a choice (and thank God I don’t! ), I’d skip it. “Ordinary Time” derives its name from the Latin “ordinalis,” meaning “ordered,” or “numbered sequentially.” During every other church season, we journey towards a culmination or apex. In Advent, we prepare for the birth of the Saviour. During Lent, we enter the wilderness, our eyes trained on the Cross. On Easter, we scale the mountaintop of the Resurrection. During Pentecost, we await Spirit and Fire — the great birthing of the Church. Why does this make me squirm? Is it because I refuse to assign spiritual value to dirty dishes and over-stuffed recycling bins? Because I don’t know how to look for God in “regular” places? If I asked you to list synonyms for the word “ordinary,” what would you come up with? “Boring?” “Unimportant?” “Insignificant?” I wonder if we even know how to inflect the word positively. In her book, An Altar in the World, Barbara Brown Taylor describes our world as “so thick with divine possibility that it is a wonder we can walk anywhere without cracking our shins on altars.” I love the description, but I rarely believe its claim. To embrace Ordinary Time is to embrace daily life itself — the routines, the chores, the missed appointments, the traffic jams. It is to trust that these mundane pieces of my life are also “altars,” imbued with the holy. The odd and interesting thing is that Jesus did most of his living in “ordinary” time. He spent the first thirty years of his life in quiet obscurity, doing manual labor. Even after his public ministry began, he was bound to the mundane by brutal necessity; in a world without running water, indoor toilets, refrigeration, cars, or computers, there’s no way his daily life could have been brisk and efficient. Some scholars estimate that Jesus walked over 20,000 miles during his lifetime on earth. How “ordinary” those miles must have felt along dusty roads, in the scorching heat or the bitter cold. Would he have called them boring? Pointless? Richard Foster writes that “the discovery of God lies in the daily and the ordinary, not in the spectacular and the heroic.” What would it feel like to believe this? I tend to think of mountaintop religious experiences as the most formative ones. But surely, what formed Jesus — what shaped him into the son, the friend, the teacher, and the healer he became — were those long, plodding days of ordinary time. When else would he have gathered, composted, seeded, and harvested the raw materials of his life? When else would he have taken root? His example makes me wonder what I’m becoming during Ordinary Time. 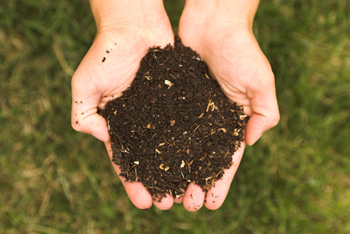 As a wife, a mother, a friend, a writer — am I composting anything? Paying enough attention to turn over and over the rich materials of my life? As I dust furniture, fold laundry, face deadlines, and just be — what is taking root in me? The great gift of Christianity, of course, is that nothing, finally, is “ordinary.” Everything in our world — every pause, every mile, every uneventful hour — is shot through with mystery. To notice this is to bend the knee at a strange and beautiful altar. The altar of the extraordinary.